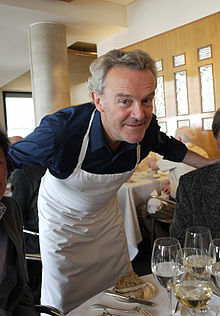 Alain Passard (French pronunciation: ​[alɛ̃ pasaʁ]; born 4 August 1956 at La Guerche-de-Bretagne, France) is a French chef and owner of the three-star restaurant L'Arpège in Paris. The son of musicians, Passard plays the saxophone. Alain Passard began his career at Le Lion d'Or in Liffré from 1971 to 1975 under the Michelin-starred Breton Chef Michel Kéréver. There, he was exposed to the fundamentals of classic cuisine. The following year, from 1975 to 1976, Passard entered La Chaumière under triple Michelin Star-holder Gaston Boyer, a culinary classicist. In 1977, Passard worked as a member of a small kitchen team at L'Archestrate, led by Alain Senderens. In 1980, at Le Duc d'Enghien at the Enghien Casino, Passard received two Michelin stars at the age of 26. At the Carlton of Brussels in 1984, he also received two Michelin stars. Chef David Kinch of the Los Gatos, California restaurant Manresa cites Passard as "the chef who has most inspired me" in his 2013 cookbook. "He is the only chef I've ever met that I can unequivocally call a true artist". He also inspired Japanese chef Fumiko Kono, training her to become a chef and teaching that colors, shapes, odors, and taste must be rigorously selected so that artistry can emerge from the quality of the product. Passard purchased L'Archestrate, located on the corner of rue de Varenne and rue de Bourgogne, from his mentor, Alain Senderens, in 1986. He renamed it L'Arpège, in tribute to his love for music, and gave it an Art Deco style interior. It earned one star in the Michelin Guide in its first year, and a second soon thereafter. It earned three Michelin stars by 1996, which it has maintained since. In 2010, he was awarded a "pépite" during the Globes de Cristal ceremony, in honor of his involvement in the fostering of French culture. In 2001, Passard had grown uninspired by cooking meat, and introduced for the first time in a three-star restaurant, at least in France, menus that would put vegetables at the centre of the plate, effectively banning meat from his restaurant. He later reintroduced meat and fish, but in smaller doses. Passard has been planning his menu based on the seasons, sourcing natural and organically grown products from artisans and farmers, including his own: Passard's desire to work with quality products led him to create three "kitchen gardens". The first took root in 2002 in the soil of Sarthe, the second in 2005 in Eure and the third in 2008 in Manche, three Départements of Western France. Three gardens in three different terroirs, giving the respective vegetables a soil-suffused signature: sand in Sarthe for carrots, asparagus and leeks; clay in Eure for celeriac and cabbage, and lastly, alluvia in Manche for aromatic herbs. The farms produce 40 tons annually of organic produce. Animal traction is employed for plowing and harvesting. It is the only restaurant to self-manage its vegetable, herb and red and black fruit production. Twelve gardeners work the trio's combined six hectares (15 acres), where donkeys, mares, cows, hens and goats also maintain residence. ^ a b c d "Alain Passard". franceinter.fr. France Inter. Retrieved 3 August 2015. ^ Kinch, David; Muhlke, Christine (September 2013). Manresa: An Edible Reflection. p. 50. ^ Godineau, Emilie (May 2004). "Fumiko Kono". Journal des Femmes (in French). Paris, France: CCM Benchmark Group. Archived from the original on 3 March 2016. Retrieved 21 November 2016. ^ a b c Marshall, Alexandra. "In Paris, a Culinary Homage to the French Master Alain Passard". nytimes.com. New York Times. Retrieved 3 August 2015. ^ "L'Arpège". themobilefoodguide.com. Retrieved 26 January 2017. ^ "L'Arpège". michelin.fr. Michelin. Retrieved 3 August 2015. ^ "Alain Passard". Chef's Table. Season 3. Episode 1 (in French). 45 minutes in. Netflix. ^ a b Majoube, Ulla. "Alain Passard: "Mes jardins sont devenus des compagnons de route"". lexpress.fr. L'Express. Retrieved 3 August 2015. The art of cooking with vegetables by Alain Passard, Frances Lincoln, 2012. This page was last edited on 7 October 2018, at 07:42 (UTC).